He(?) has been in my balcony garden since late February. So this is his gorgeous winter vacation house, maybe? 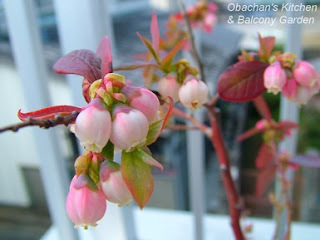 The colour of the blueberry bush is just beautiful :) Is it potted? Wow, I can't wait for more news about the blueberries! Good luck with it obachan and I hope everything's going good for you! 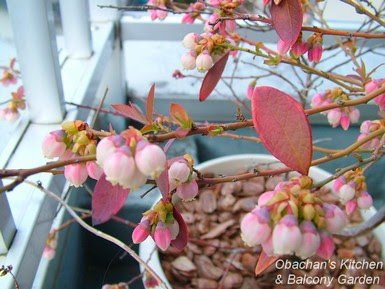 What a beautiful pink color...I hope your blueberries turn out well this year. 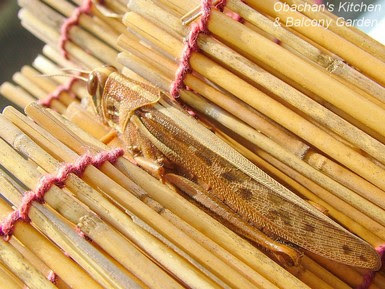 Well, yeah, it has grown a little taller in the past couple of years… Oh, you’re talking about the grasshopper?? I promise. I’ll post about it as much as possible and share any news about it. Thank you. Things are going well so far, and I’m looking forward to my new experience in May. This “Sunshine blue” seems to be known for its lovely pink flowers (instead of white) and I’m glad I got this variety.